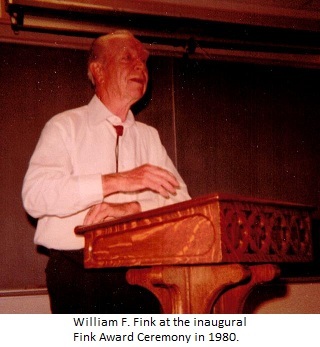 William H. Fink died March 14, 1991 in Dewey, Arizona. He was born May 2, 1909, in Findlay, Ohio. He earned his bachelor of science degree at The Ohio State University and was a Chief Petty Officer in the U.S. Navy during World War II. After the war, he earned his Ph.D. in economics at the University of California at Berkeley. After teaching economics for 19 years at the University of Arizona in Tucson, he retired in 1973. He moved to Dewey from Tucson in 1978. Professor Fink established scholarship funds in philosophy at The University of Arizona, the University of California at Berkeley, and at The Ohio State University. All religionists, not just fundamentalists and Catholics, argue that without belief in "God" one has no reason to be moral or law abiding, which obviously is horseshit. His plan for "Eschewing Tobacco" (and ending the Cold War) was to subsidize exporting billions of cheap cancer-producing cigarettes to Russia. He inundated the editorial pages of Prescott Courier and Arizona Republic with letters on his favorite topics. Here is the text of a letter he wrote for Jefferson's birthday. It was printed in the Courier. Thomas Jefferson, our third President, was an agnostic—a philosopher and freethinker. Said Jefferson, "Question with boldness even the existence of God, because if there be one, He must approve the homage of Reason rather than that of blindfolded fear." Among educated people he is regarded as the greatest man America has produced. Born in 1743, he died at Monticello on July 4, 1826—fifty years to the day after the July 4th he did so much to make historic. He had written his own epitaph: "Here was buried Thomas Jefferson, author of the Declaration of American Independence [at age 33], of the Statute of Virginia for Religious Freedom and Father of the University of Virginia." He was called "the pen of the Revolution." He was more than that. He was its conscience. I agree with the full-page ad of Allied Chemical Corporation which appeared periodically in The New Yorker in 1983. Over the following boldface type: OF ALL THE WORLD'S GREAT THINKERS, WHICH IS THE GREATEST? are 8 portraits. In the center is Jefferson, flanked by Sir Isaac Newton and Charles Darwin, with Leonardo da Vinci above and Albert Einstein below. The other three are Aristotle, Shakespeare, and Marie Curie. Distinguished company you will agree. Now, what must we think of an American President who not only is too religious to appreciate the freethinking Jefferson, but actually fears the man and his philosophy? Upon moving into the White House, some say at the urging of his Favorite Fellow Fundamentalist "Fetus the Fatuous Fakir" Falwell (it's called alliteration), Ronnie ordered the large Jefferson portrait removed. Nothing he has said or done before or since so clearly demonstrates the abysmally low intellectual level of the current president. From such genuine statesmen and thinkers as Jefferson and James Madison to such half-educated second raters as Nixon and Reagan! Such has been the decline of the American Presidency; little wonder that this Nation is in trouble. In 1980, Professor Fink attended the department's first presentation of our Fink Prize, and impressed everyone with his characteristic humor. Failing health prevented him from returning, but each year at our presentation of the Fink Award we pause to recall his forceful personality, his love of liberty, and his willingness to back his ideals with a material investment. Professor Fink believed, and said, that "most college professors are too cowardly to stick their necks out in defense of freedom of expression." This was obviously a class of professors that did not include Bill Fink, and we will remember him fondly for his bold and joyful R-rated mind, for his generous heart, and his courageous love of the truth as he saw it.